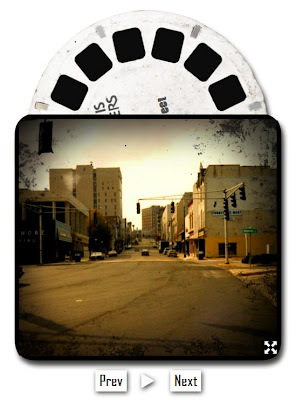 We've created an "Old School" Main Street reel in celebration of the "new" Main Street in Danville's River District. Click here to see how far we've come! Virginia tourism officials have launched a new website to help Virginians share and find the best small town treasures and old school favorites. Click here to learn more. If you missed the Main Street Ribbon Cutting event today, here's a little clip of the action! Post by City of Danville, Office of Economic Development. Happy Holidays to everyone! Looking forward to 2014 and all the new and exciting things it will bring the the River District. To the tune of "People Get Ready"
We just all need to get on board. Calling downtown the hallmark of any city, Danville officials held a ribbon-cutting ceremony on Friday for the first phase of the River District streetscape project. The ceremony marked the close of construction in the 300, 400 and 500 blocks of Main Street and the block of Union Street between Main and Spring streets. Mayor Sherman Saunders said the streetscape project and other improvements were essential to attract private investment. Saunders said past impressions of Danville’s downtown were not favorable. Potential investors, he said, “took their money” elsewhere. “We knew we had to invest in our downtown,” Saunders said. Construction on the first phase of the streetscape project began in September 2012. The activity ranged from widening sidewalks and installing brick pavers to creating more visible and safer pedestrian crossings, upgrading utilities and providing amenities such as trees, benches and new lighting. Karl Stauber, president and chief executive of the Danville Regional Foundation, said the improvements along Main Street present a striking transformation. The foundation has been a partner in the River District project, and it provided funding for the purchase and demolition of the former Downtowner Motor Inn on Main Street. The building was demolished last year. After standing empty for more than two decades, the demolition was a focal point for blight eradication and redevelopment in the River District. Saunders and King acknowledged that merchants along Main and Union streets were negatively affected during the construction process. “Today, we would like to express our deepest gratitude to our merchants and their patrons for their patience,” Saunders said. King encouraged residents to support these merchants. The streetscape phases are part of the broader River District Development Project, which is in its third year. As part of the project, the city has adopted design guidelines for the look and feel of buildings in the district; converted Patton Street to two-way traffic in order to provide better access to businesses and parking lots serving stores on Main Street; opened a new parking lot at 500 Main St.; and conducted a parking study for the full district. Designs are being developed for creation of a pedestrian lane on the Martin Luther King Jr. Memorial Bridge to connect the walking trail on the north side of the Dan River to the Main Street Plaza and the walking trail on the south side of the river. The River District has attracted $78 million in private investment over five years, with much of the activity having taken place since the start of the River District Development Project. That figure outpaces public investment by threefold. For more information, visit www.riverdistrictdanville.com. 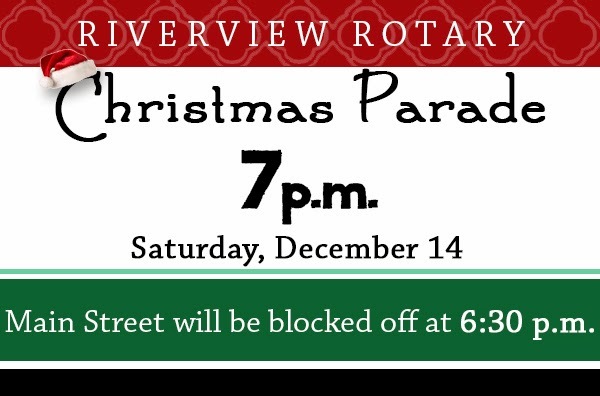 Riverview Rotary Parade start time has been changed to 7 p.m. This year's theme is "Christmas Movies." Join us for a fabulous display of floats, cars, marching bands, marching units and more. Greet Santa and Mrs. Claus as we welcome the holiday season. Click here for more information and also find tips for parade goers here. The Luminary Trail Walk - 6 p.m.- 8 p.m. at the Crossing at the Dan at the Community Market. Celebrate the season with a candlelight walk along the Riverwalk while listening to holiday music. Warm festive refreshments will be served. Wine and Beer Tasting from Noon to 5 p.m. at Vintages by the Dan. Rod Tomlinson will be pouring the Boulevard Tank 7 and Kelly's Hard Cider. The will also be opening Crane Lake's Pinot Grigio and Cabernet Sauvgnon. These well priced California wines would be perfect for a holiday party! Downtown Christmas Tree Lighting at 4 p.m. in the Main Street Plaza (in front of Lou's Antiques, Jake's on Main, and Amburn and Co. Salon and Spa on Main). Canned food will be collected for God's Storehouse. Arrive early to hear the carolers and local singers before we light the tree! The Downtown Danville Association’s new Christmas tree was planted Thursday, just in time for its official lighting at 4 p.m. Saturday. The tree replaces one inadvertently cut down during the River District streetscape project last summer, according to Jerry Amburn, who has been the association’s Christmas Tree Committee chair for several years. Bert Lewis, of Lewis Nursery in Cascade, said the new Foster Holly tree will grow to be 18-20 feet tall and grow at a rate of about a foot a year. The tree is in the landscaped area at the top of the parking lot stairs, between Lou’s Antique Mall and Jake’s on Main. After enjoying the tree lighting ceremony and carolers, guests can get into prime positions for the Danville Riverview Rotary Parade, which begins at 7 p.m. 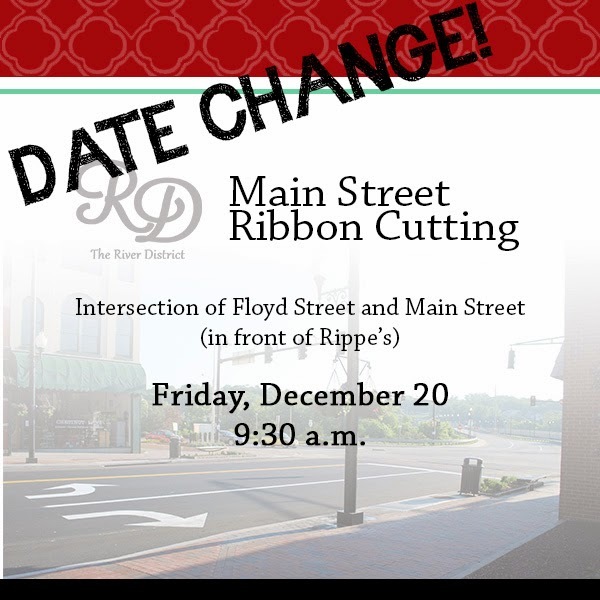 The Main Street ribbon cutting — celebrating completion of phase one of the River District streetscape project — has been rescheduled to 9:30 a.m. Dec. 20, at the intersection of Floyd and Main streets. River District Events and Ribbon Cutting Rescheduled. Construction on the 300, 400 and 500 blocks of Main Street is complete! Please join us for a ribbon cutting in celebration of the first phase of the Streetscape project in the River District. 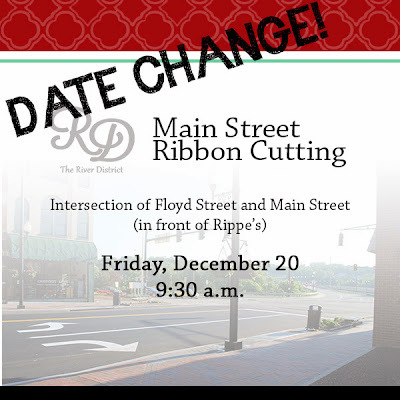 Due to the possibility of inclement weather on Saturday, the Main Street Ribbon Cutting will be postponed to next Friday, December 20th at 9:30 a.m. Please be advised that this DOES NOT affect the Danville Riverview Rotary Parade or the Downtown Danville Association’s Christmas Tree Lighting Event. All questions regarding these holiday events can be directed to the responsible organization. Downtown Christmas Tree Lighting at 4 p.m. in the Main Street Plaza (in front of Lou's Antiques, Jake's on Main, and Amburn and Co. Salon and Spa on Main. Canned food will be collected for God's Storehouse. Arrive early to hear the carolers and local singers before we light the tree! Riverview Rotary Parade at 7 p.m. Click here for more information This year's theme is "Christmas Movies." Join us for a fabulous display of floats, cars, marching bands, marching units and more. Greet Santa and Mrs. Claus as we welcome the holiday season.